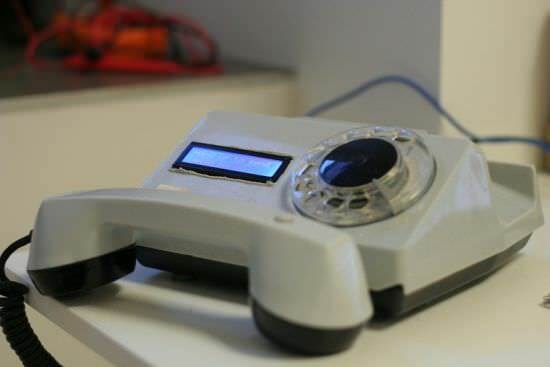 It’s one of those concepts that had to be created, the marriage of an analogue rotary phone with a tweeter client. Ladies and gentlemen we present to you the Tweephone. The brainchild of UP Digital Bureau and the creation of Unteleported tech agency. Running on an Arduino platform, it translates dial turns to characters. You only have to pick-up the handset and go through the arduous, but ultimately rewarding, task of dialing each letter of your allotted 140-character limit. For example to get an ‘a’ you would have to dial ‘2’ once, and to get an ‘f’ you need to dial ‘3’ three times. The Tweephone displays tweets, as you ‘spin them’ on a very fashionable alphanumeric liquid crystal display. To send the tweet you just hang-up the phone. You can find a lovely video of the Tweephone after the break. Oh and could someone, please, please send us a tweet using the Tweephone!